June 16, 2009 -- An exhibition about the early years of European travel and settlement in Arkansas, "Exploring the Frontier," includes a replica of a Native American canoe. "Exploring the Frontier" is scheduled to open at the Arkansas State University Museum in October, 2009, but a sneak peek at the exhibition, including the replica canoe, will open on Thursday, July 16, as part of the ASU Museum's three-day extravaganza, "Our Awesome Ancestors: Celebrate Human Ingenuity. The original canoe, dated tentatively either 1680 or 1840, is referred to as the "Griggs Canoe" and is on exhibit at the Toltec Mounds Archeological State Park in Scott, Arkansas. This "…excellent example of the southeastern Indian’s fascinating culture" floated to the surface following floods along the Saline River in the winter of 1982–1983 and was discovered by Mr. and Mrs. A. F. Griggs, who donated the canoe to Toltec Mounds. Examples of ancient wooden artifacts are rare because organic matter, such as wood, decomposes rapidly and does not survive. Hundreds of years ago the original canoe probably was submerged into the mud and rested safely there, cut off from the oxygen necessary for decomposition. More information on the canoe can be found at http://www.arkansasstateparks.com/images/pdfs/Toltecgriggscanoe.pdf. Photo courtesy of Gladys Nalezny. 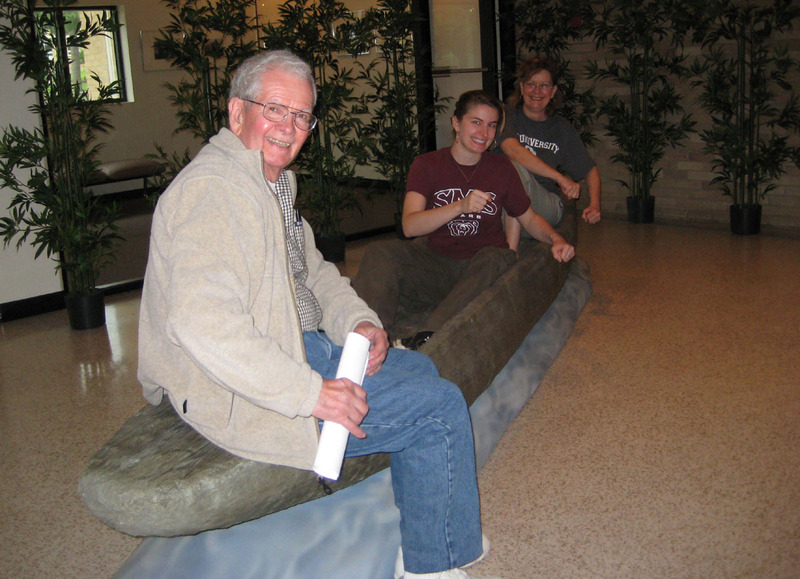 The ASU Museum's replica of the Griggs Canoe is designed for touching and for sitting in, and provides a particularly good setting for family photographs, as evinced by the three generations of the Nalezny family, of Paramus, New Jersey, disporting themselves in the canoe. "Exploring the Frontier" is one of the Arkansas Discovery Network’s Museum Road Trip series of exhibitions that will travel the state in upcoming years. The Arkansas Discovery Network is funded by the Donald W. Reynolds Foundation.